Today’s prompt: What central story is at the core of you, and how do you share it with the world? You see that tree over there? One of these days I’m going to climb that tree. 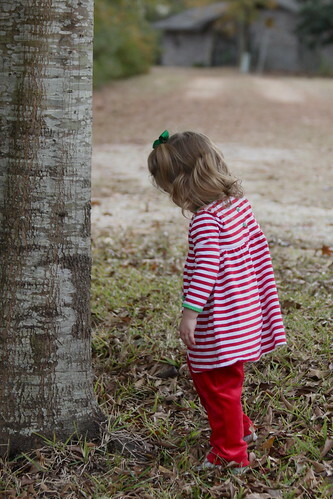 Like my niece shown in the picture here, I’m always picking out the biggest trees to climb. Other kids might find a low hanging branch on a sweet little crape myrtle and be done with it, but as for me, if there’s a bigger oak nearby, I’m going to worry around it until I think of a way to at least get a foothold on it. Some might call that unrealistic. I just like to think of it as imaginative. I am prone to flights of fancy. That’s what makes me think I’m a writer. That’s what makes me think I’m a photographer. That’s what makes me think nothing is worth doing if it isn’t worth overdoing. But I did it. I posted something to this blog every single day for the past 365 days. I didn’t think I would. I actually just set out to see how many days in a row I could post something to the blog without missing a day. I thought I might make it six weeks or so. When I surpassed that, I still threatened to quit fairly often up until the point that I realized I was three-quarters through a year. Then the idea of finishing a complete year caught my fancy. I was bound and determined to see it through. I don’t really know what I’ve proven. Probably nothing. But the blog in itself has been a pleasure to me. I’m happy to say I’ve stuck it out. This is the last day I’m posting here to this particular blog, but if you come back tomorrow, you will still find me here. I’m going to rebuild the blog tomorrow (or at least start rebuilding). I’ve been planning to do a reinstall on WordPress for some time because I have some corruptions in my current installation. I just wanted to finish my year first. I don’t think I will have to miss a day of blogging in order to reinstall, but catastrophes sometimes happen, and I didn’t want to take a chance on disrupting my year. The 2010 blog will be archived in its entirety. I may never finish another 365 blog in my life. I want to keep this one on display just in case. Meanwhile, we move on. Tomorrow I will build a new blog and set out to see how many days in a row I can post something to it. I don’t know why. I don’t know why I pick any given tree to climb. Because it’s there, I suppose. And because it tickles my fancy to think I can. That’s my story, and I believe I’ll just stick to it. How neat that you posted every day for an entire year. You’ll never forget 2010. All the best in 2011!